KRATER COMEDY CLUB: Until March 31, 7pm/8pm/10.30pm, £5-£36.50 Komedia, 44-47 Gardner Street, Brighton 0845 293 8480. PAUL MERTON’S IMPRO CHUMS: £22-£24, 8pm Brighton Dome (01273) 709709. Paul Merton, Lee Simpson, Richard Vranch, Suki Webster and Mike McShane. THE MAYDAYS: 7.30pm Komedia, 44-47 Gardner Street, Brighton 0845 293 8480. Confessions! And Guest Improv Superstars. LEWES RIVERSIDE CLUB: My Life in Showbusiness by Howard T’Loosty, 2pm St Thomas’ Church Hall, Cliffe, Lewes. WALK: Meet 11am in the car park above Barns Green Village Hall, RH13 0PT, enter by way of the car park outside the Village Hall, which is marked by yellow road markings. 2 mile HDC walk, firm underfoot but can be muddy. One gentle incline, some views. Well behaved dogs welcome. 60 mins. Chatter 07720 714306. BLUNTER BROTHERS: Horsham Sports Club, 7.30pm-11pm. GIGNITE: The Shelley Arms, Broadbridge Heath, 8pm-11pm. STONE COLD SOBER: The Plough, Lower Beeding, Horsham, 7pm-11pm. MIKE AND THE MECHANICS: £36-£41, 7.30pm Congress Theatre, Eastbourne (01323) 412000. Looking Back Over My Shoulder Tour. MURDOCH’S CRAZY EYES: The Kings Head, Billingshurst, 8.30pm-11pm. PIRANHAS FOUR +: £6, members free, 8pm Lewes Con Club, 139 High Street, Lewes 01273 473076. Plus Unorfadox. RUMOURS OF FLEETWOOD MAC: £26.50-£36.50, 8pm The Hawth Theatre, Crawley (01293) 553636. Anniversary Tour. THE SIMON AND GARFUNKEL STORY: Fiftieth Anniversary Tour, The Capitol Theatre, Horsham, 7.30pm-11pm. THINK FLOYD: £26.50, 7.30pm White Rock Theatre, Hastings (01424) 462288. Tribute band. DADS ARMY RADIO SHOW: 320, 7.30pm Chequer Mead, East Grinstead (01342) 302000. Celebrating 50 years of Perry and Croft’s BBC sitcom. SEIZE THE NIGHT 2: £12, 7.30pm Latest MusicBar, 14-17 Manchester Street, Brighton (01273) 687171. Up All Night! Music, dancing and comedy for charity. PAUL MERTON’S IMPRO CHUMS: £23, 8pm De la Warr Pavilion, Bexhill (01424) 229111. Paul Merton, Lee Simpson, Richard Vranch, Suki Webster and Mike McShane. SEANN WALSH: From £16.50, 8pm Assembly Hall, Stoke Abbott Road, Worthing 01903 206206. After This One, I’m Going Home. HORSHAM AND DISTRICT HORTICULTURAL SOCIETY: Annual Spring Show and Plant Sale. Cookery, handicrafts, paintings and drawings sections. Public viewing 2.15pm-3.45pm before trophies are awarded. There will also be a grand raffle, delicious refreshments and plants/rhubarb for sale. North Heath Hall, St Marks Lane, Horsham, RH12 5PU. All very welcome. Entry by donation. HOVE LOCAL SATURDAY MARKET: 1.30-4pm, Cornerstone Community Centre, Church Road, Hove. Join us at this friendly market, grab a cup of tea/coffee and browse/buy from a diverse mix of stalls including eco friendly household cleaning products, handcrafted art, jewellery, scarves, candles and bags, quality clothing, bric-a-brac, vegan food and more. MID SUSSEX RAMBLERS: Ashington, 9 miles with Alison G 01273 833794. Meet at Rectory Lane, Ashington, 10am. Or, Pagham harbour Bird Watching Walk, 5 miles with Peter L 01444 415367. Meet at RSPB Pagham Harbour, 10.40am. SPRING SHOW: St Mary’s Gardening Club Spring Show, 2pm-4.30pm St Mary’s Social Centre, Christie Road, Lewes. SUSSEX GROUP SPRING LECTURE:Talk by Steve Bustin on ‘Ghosts, Guns and Guerrilla Gardening – The Life and Times of Ellen Willmont.’ An influential woman, first-ever recipient of the RHS Victorian Medal of Honor (VMH). Talk starts at 2pm at Haywards Heath Town Hall, 40 Boltro road, Haywards Heath, RH16 1BA. Admission £4 plant/seed sales, raffle, refreshments. LONDON PHILHARMONIC ORCHESTRA: £10-£60.50, 7.30pm Brighton Dome (01273) 709709. Legends of The North. LUNCHTIME CONCERT: Free with retiring collection, 1pm St Leonard’s Church, Seaford. Piano Duo. Ashworth an Rattenbury Guitars. DARKSTAR RISING: The Star, Roffey, Horsham, 8.30pm-11pm. HORSHAM ROCKS PRESENTS: Sheila Ballard, Carfax Bandstand, Horsham, 1pm-3pm. LEE COLLINSON: The Chapel, Billingshurst, 8pm-11pm. MARK MORRISON: £12, 7pm Komedia, 44-47 Gardner Street, Brighton 0845 293 8480. Mark Morrison (The Bluetones) plus support from Mike Wilton. SATURDAY FOLK CLUB: £6, 8pm Elephant and Castle, Lewes. Jack Hogsden an Leon Hogsden. SOLID SILVER 60’S SHOW: From £27.50, 7.30pm Pavilion Theatre, Marine Parade, Worthing 01903 206206. Peter Noone and Brian Poole plus Dave Berry an Vanity Fare. THE BOURNE AGAIN SHADOWS: £18-£20, 7.45pm The Hawth Theatre, Crawley (01293) 553636. Tribute band. THE FARMBOYS: The Malt Shovel, Horsham, 8.30pm-11pm. THE KING IS BACK: £30-£34.50, 8pm White Rock Theatre, Hastings (01424) 462288. Ben Portsmouth as Elvis Presley. DISCO INFERNO: £27.50, 8pm The Royal Hippodrome, Eastbourne (01323) 802020. Live disco sound of Heatwave and the voice of Rose Royce, Gwen Dickey. 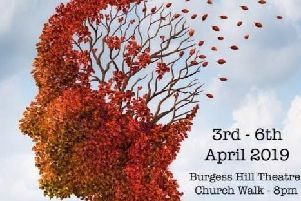 EAST GRINSTEAD MUSIC AND ARTS FESTIVAL: 9am and April 7, Chequer Mead, East Grinstead (01342) 302000. Youth production. Today’s event is Dance. LOUD AND CLEAR: £7-£10, 2pm De la Warr Pavilion, Bexhill (01424) 229111. A discussion on the language used in Still I Rise. Feminisms, Gender, Resistance, Act 2. SHOWSTOPPER! : From £13, 7.30pm Theatre Royal, Brighton 0844 871 7650. The Improvised Musical. THE WALRUS AND THE CARPENTER: £6.50, 11.30am The Hawth Theatre, Crawley (01293) 553636. Puppet show. BENT DOUBLE: 7.30pm Komedia, 44-47 Gardner Street, Brighton 0845 293 8480. Headliner Mary Bourke, MC Zoe Lyons. MYRA DUBOIS: Dead Funny. £8, 8pm Komedia, 44-47 Gardner Street, Brighton 0845 293 8480. Edinburgh RI Preview. ANTIQUE AND COLLECTORS FAIR: Grange Centre, Bepton Road, Midhurst, GU29 9HD. Public admission 10.30am-4pm, £1.50. Wide variety of antiques and collectables including pottery, porcelain, gold and silver, glass, jewellery, coins, fashion accessories, military badges and postcards. Buying and selling. Large free car park adjoining. Enquiries to Emmott Promotions on 07747 604541 or visit www.emmottpromotions.co.uk. BAKED GOODS SALE: In aid of Baxter’s Field. Lower gate, Bradford Road, 9am-1pm. Donated goods welcome 01273 472251. BEACHY HEAD RAMBLERS: Downland Trails and Coastal Views, 11 miles with Colin W 07446 458138. Meet at Butts Brow car park, Willingdon, 10am. CEREMONIES OPEN DAY: At Southover Grange, organised by East Sussex registration, 10am-2pm. DIVINE SERVICE: With medium Hilary Ellis, 6.30pm, Barnham Community Hall, Yapton and Barnham SNU Spiritualist Pioneer Centre. LEWES FOOTPATHS GROUP: Seaside Walk to Peacehaven, 6 miles (picnic lunch) with Hilda an Graham 472678. Meet at Lewes Bus Station 9.48am bus 28 to Brighton. MID SUSSEX RAMBLERS: Bluebell Time, 4 miles with William 01444 831098. Meet at St Peter’s Church, Chailey Green, 2.30pm. OLDLAND MILL: Keymer. The first Open Afternoon of the year, 2pm-5pm. See inside the oldest regularly working windmill in Sussex. Refreshments, memorabilia and the mill’s own flour available. No vehicles allowed at the Mill. Please park in Grand Avenue near the Thatched Inn and walk up Oldlands Lane, or make use of the complimentary minibus available outside the Thatched Inn. Info: Fred Maillerdet 01273 842342, www.oldlandwindmill.co.uk. PRO MUSICA: 7pm, St Andrew’s Church, Alfriston. Mozart’s Requiem, Exsultate Jubilate and Ave Verum. Tickets £12 available from members, on the door or online. WORTHING SYMPHONY ORCHESTRA: From £19, 2.45pm Assembly Hall, Stoke Abbott Road, Worthing 01903 206206. Grleg Piano Concerto. ART GARFUNKEL: £40.50-£60.50, 7.45pm Brighton Dome (01273) 709709. An evening of songs and stories. BEATLES DAY 20: £16, noon-10.30pm White Rock Theatre, Hastings (01424) 462288. HARDWICKE CIRCUS: 8pm Latest MusicBar, 14-17 Manchester Street, Brighton (01273) 687171. Plus support. JAZZ LUNCH: £21.95, noon, The Hawth Theatre, Crawley (01293) 553636. Featuring Javajam. MOYA BRENNAN: The Voice of Clannad, The Capitol Theatre, Horsham, 7.30pm. SARI SCHORR: £17.50, 7.45pm The Hawth Theatre, Crawley (01293) 553636. Blues Night. THE SUNDAY SESSIONS: Robbie Lee, Queen’s Head, Barns Green, Horsham, 4pm-6pm. THE UNDERCOVER HIPPY: £12, 7.30pm Lewes Con Club, 139 High Street, Lewes 01273 473076. LIPSTICK ON YOUR COLLAR: £23, 7.30pm The Hawth Theatre, Crawley (01293) 553636. The 50’s and 60’s show. THE BIRTH OF LTC: £5, 2.30pm Lewes Little Theatre, Lancaster Street, Lewes (01273) 474826. Dramatise rehearsed reading in the foyer. RICKY GERVAIS: £23, 7.30pm and April 9, The Hawth Theatre, Crawley (01293) 553636. Supernature: Warm-up shows. SUSSEX FAMILY HISTORY GROUP: Battle of Lewes by Allison Caffyn, 7.30pm in Bridge Cottage, High Street, Uckfield. The Group: 8pm, a pub in Burgess Hil. Unattached? The Group, for men and women aged 50+, meets on the second Monday evening of every month. It is an opportunity to meet new people. Walks, theatre, golf, lunches and dinners, holidays. Also in Lewes, Brighton and Horsham. Visit www.thegroup.org.uk. WALK: Meet and park 10.30am at Hillier Garden Centre, Brighton Road in the car park at the very bottom and park on the gravel. 6 mile HDC walk just south of Horsham to Sedgwick Park. Views. Can be muddy. No dogs please. 2.5 hrs. Jill 07780 701184. HORSHAM FILM SOCIETY: The Best of World Cinema, The Capitol, Horsham, 8pm, The Handmaiden, South Korea 2016, 184 mins, drama, cert 18. In Korean with English subtitles. A ravishing crime drama inspired by the novel Fingersmith by Welsh author Sarah Waters. Set in 1930s-era colonial Korea and Japan, the film is a gripping, sensual tale of a young Japanese lady living on a secluded estate, and a Korean woman who is hired to serve as her new handmaiden, but who is secretly involved in a conman’s plot to defraud her of her large inheritance. Guest membership available (tickets £5 on the door). Visit horshamfilmsociety.wix.com/horshamfilmsociety. The Group: 8pm, a pub in Burgess Hill. Unattached? The Group, for men and women aged 50+, meets on the second Monday evening of every month. It is an opportunity to meet new people. Walks, theatre, golf, lunches and dinners, holidays. Also in Lewes, Brighton and Horsham. Visit their website at www.thegroup.org.uk. ROCK OF AGES: £26-£47, 7.30pm until April 13 (Thurs/Sat mat 2.30pm) Congress Theatre, Eastbourne (01323) 412000. Award-winning smash hit musical featuring 80’s hits. WAVE – BRIGHTON PODCAST FESTIVAL: £16, 8pm Komedia, 44-47 Gardner Street, Brighton 0845 293 8480. CTRL ALT Delete Live with Emma Gannon. MICKY P KERR: £15, 8pm Komedia, 44-47 Gardner Street, Brighton 0845 293 8480. Z-List Celebrity: Life After the Britain’s Got Talent Finals. MID SUSSEX RAMBLERS: Ghosts of The Steam Age, 8 miles with John 01444 483860. Meet at Partridge Green Recycling car park, 10.30am. WALK: Meet 10am in the car park beyond Barns Green Village Hall, Muntham Drive, RH13 0PT. Seven miles HDC walk south-west towards Coneyhurst, then north on outskirts of Billingshurst. Fairly flat, a few stiles. Likely to be muddy. No dogs. 3 hrs. Jan 01403 783889 and David 01483 279713. COLLABRO: From £21.50, 7pm Pavilion Theatre, Marine Parade, Worthing 01903 206206. With special guest Kerry Ellis. JACK LUKEMAN: £12, 7.30pm Komedia, 44-47 Gardner Street, Brighton 0845 293 8480. Irish singer-songwriter. HORMONAL HOUSEWIVES: £26, 7.30pm The Royal Hippodrome, Eastbourne (01323) 802020. Written by Julie Coombe and John MacIsaac. WAVE – BRIGHTON PODCAST FESTIVAL: £16, 7.30pm Komedia, 44-47 Gardner Street, Brighton 0845 293 8480. Unexplained – Live. ANGELA BARNES: Rose Tinted. £14-£16, 8pm The Hawth Theatre, Crawley (01293) 553636. GARY DELANEY: Gagster’s Paradise. 8pm Komedia, 44-47 Gardner Street, Brighton 0845 293 8480. ART SOCIETY: Uckfield, Lewes and Newick Art Society, 250 Years of The Royal Academy by Rosalind Whyte, 2.30pm at Uckfield Civic Centre. BEACHY HEAD RAMBLERS: Highest Chalk Cliff in Britain, 10 miles with Richard S 07546 242230. Meet at Eastbourne Youth Hostel car park, off A259 west of Eastbourne, 10am. HORSHAM ARTS SOCIETY: April lecture, John Peter Russell – Lucrezia Walker. Coffee from 9.45am. Lecture starts at 10.45am. Non-members are welcome for a fee of £5 payable on entry. SUSSEX FAMILY HISTORY GROUP: An Illustrated Walk Around Alfriston by Kevin Gordon, 7.30pm in the Ventnor Hall, Blatchington Road, Hove. THE MID SUSSEX FRANCO-BRITISH SOCIETY: Haywards Heath, www.midsussexfrancobritish.co.uk. Next meeting 8pm-10pm, Function Suite, Clair Hall, Perrymount Road, Haywards Heath, RH16 3DN. An illustrated talk in French by Bernard Masson, Président de l’Association des Membres de l’Ordre National du Mérite de France, Section de Grande Bretagne. Entitled ‘L’Art des tire-bouchons du 18ème siècle à nos Jours’. All members and visitors welcome. Info: Secretary, Mrs. Barbara Stevens, 01444 452385, dandbstevens@btopenworld.com. Visit www.midsussexfrancobritish.co.uk. The annual Society membership fee is £22, payable in September. Visitor’s fee is £5 per evening, payable at meetings. WALK: Meet 10am, Henfield Library, High Street, Henfield, BN5 9HN. 2-3 miles HDC Health walk around the twittens, ginnells and snickets of Henfield. May be extended if walkers wish. No dogs. 1 hr. Anne 01273 493671. OPEN MIC: The Anchor Inn, Storrington, Pulborough, 8.30pm-11pm. EASTER PANTOMIME: £15-£15.50, various times until April 13, The Royal Hippodrome, Eastbourne (01323) 802020. Snow White and the Seven Dwarfs. MILKSHAKE LIVE: £16-£17.50, noon/3.30pm The Hawth Theatre, Crawley (01293) 553636. Milkshake Monkey’s Musical. KIERAN HODGSON: ‘75. £11-£12, 8pm Komedia, 44-47 Gardner Street, Brighton 0845 293 8480. MATT’S COMEDY CLUB: Free, 8pm Pavilion Cafe Bar, Marine Parade, Worthing 01903 206206. Open Mic Night. NATIONAL SAMOSA WEEK: Diverse Crawley are holding a free event at Crawley Hospital Cafe, 11am-2pm. Try some delicious meat and vegetarian samosas. A celebration of South Asian food and culture. Diverse Crawley has also organised a event on May 25 at the Civil Hall, celebrating the United Nations declared World Day for Cultural Diversity, 12pm-4pm. POLEGATE RAMBLERS: Wannock and Back, 4.5 miles with Sue 07903 220544. Or, Spring Time Downland Ramble, 12 miles with Colin 07446 458138 (picnic). Meet at Wannock Road Recreation Ground, 9.30am. LET’S HANG ON: £25.50-£26.50, 7.30pm The Hawth Theatre, Crawley (01293) 553636. Tribute to Frankie Valli and The Four Seasons. THE DARKSIDE OF PINK FLOYD: £18.50, 7pm Komedia, 44-47 Gardner Street, Brighton 0845 293 8480. Tribute band. AN EVENING WITH STEVE PARRISH: £21, 7.30pm Chequer Mead, East Grinstead (01342) 302000. GOVERNMENT INSPECTOR: £14-£16, 7.45pm The Hawth Theatre, Crawley (01293) 553636. Comedy theatre. TWIST AND SHOUT: £25, 7.30pm Devonshire Park Theatre, Eastbourne (01323) 412000. The sounds of the Swinging Sixties. Cineworld Brighton Marina (0871 200 2000): Movies For Juniors: A Dog’s Way Home (PG) Fri, Sat & Sun 10.00. Captain Marvel (12A) Fri, Sat, Sun, Mon, Tue & Thu 1.40, 4.40, 7.40; Wed 12.15, 5.30, 8.40. Dumbo (PG) Fri, Sat, Mon, Tue & Wed 11.10, 12.20, 1.50, 3.00, 4.30, 5.40, 8.20; Sun 12.20, 1.50, 3.00, 4.30, 5.40, 8.20; Thu 11.00, 12.20, 1.40, 3.0, 4.20, 5.40, 8.20. Fisherman’s Friends (12A) Fri & Sat 5.10, 7.50; Sun, 5.10; Tue & Wed 7.30. How To Train Your Dragon: The Hidden World (PG) Fri & Sat 11.50; Mon, Tue & Thu 11.00. Missing Link (PG) Fri-Thu 10.50, 1.10, 3.30, 5.50, 8.10. Peppa Pig: Festival Of Fun (U) Fri-Thu 10.15, 12.15, 2.15, 4.15. Pet Sematary (15) Fri-Thu 1.20, 3.50, 6.20, 8.50. 3D: Shazam! (12A) Fri-Thu 5.30. Shazam! (12A) Fri, Sat, Sun, Mon, Tue & Wed 11.30, 2.30, 7.15, 8.30; Thu 11.30, 2.30, 5.30, 8.30. Movies For Juniors: The Kid Who Would Be King (PG) Fri, Sat, Mon, Tue, Wed & Thu 10.30; Sun 10.40. The Lego Movie 2: The Second Part (U) Fri & Sat 11.00; Sun 11.45; Mon, Tue & Wed 10.40; Thu 10.50. Us (15) Fri, Sat & Sun 2.20, 6.10, 9.00; Mon, Tue, Wed & Thu 6.10, 9.00. Autism Friendly Screening: Dumbo (PG) Sun 11.00. Malayalam: Lucifer (12A) Sun 7.50. Unlimited Screening: Eighth Grade (15) Mon 8.00. Wonder Park (PG) Mon 10.10, 1.10, 3.20, 5.45; Wed 10.10, 1.00, 3.10, 5.20; Thu 10.10, 1.30, 3.40. Hellboy (15) Thu 5.50, 8.40. NT Live: All About Eve (12A) Thu 7.00. Duke Of York’s (0871 902 5728): The Sisters Brothers (15) Fri 3.00, 8.45; Sat 3.30, 6.15; Sun 11.15, 5.00; Mon 12.45, 6.00; Tue & Wed 6.00; HOH Subtitled: Tue 12.15; Big Scream: Wed 12.15; Silver Screen: Thu 12.00, 3.00. Out Of Blue (15) Fri 12.30; Sat 9.00; Mon 3.30; Tue 8.45; Wed 3.00. The White Crow (12A) Fri 6.00; Sat 12.45; Mon & Wed 8.45; Silver Screen: Tue 3.00. Kids’ Club: Despicable Me 2 (U) Sat 10.30. Toddler Time: Octonauts: Creature Egg Hunt (U) Mon 11.15. Vintage Sundays: A Clockwork Orange (Re: 2019) (18) Sun 2.00. Première Screening: The Unknown Torres + Q&A With Sergio Torres (tbc) Sun 8.00. Bite-Sized Ballets: Elves And The Shoemaker (U) Wed 10.30. NT Live: All About Eve (12A) Thu 7.00. Orion (01444 243300): NT Live: All About Eve (12A) Thu 7.30. Shazam! (12A) Fri 5.15, 8.15; Sat-Wed 1.00, 4.15, 8.15; Thu 12.30, 3.45, 8.15. Dumbo (PG) Fri 5.00, 7.45; Sat-Wed 12.00, 2.45, 5.30, 7.30; Thu 12.00, 2.45, 5.30. Cineworld (0871 2208000): Captain Marvel (12A) Fri, Sat, Sun, Tue & Wed 2.10, 4.50, 7.40; Mon 2.10, 7.40; Thu 12.20, 3.10, 7.50. Dumbo (PG) Fri & Sat 11.00, 12.20, 1.40, 3.00, 4.20, 5.40, 7.00, 8.20; Sun, Mon, Tue & Wed 12.20, 1.40, 3.00, 4.20, 5.40, 7.00, 8.20; Thu 12.20, 1.40, 3.00, 4.20, 5.40, 8.20. Fisherman’s Friends (12A) Fri & Sat, 2.20, 6.10; Sun 11.40, 6.10; Mon 5.00; Tue & Wed 8.50; Thu 6.20. How To Train Your Dragon: The Hidden World (PG) Fri & Sat 11.40; Sun 1.20; Mon, Tue, Wed & Thu 10.00. Missing Link (PG) Fri, Sat & Sun 10.00, 11.50, 1.10, 2.30, 3.30, 5.50, 8.10; Mon, Tue, Wed & Thu 10.50, 12.00, 1.10, 2.20, 3.30, 5.50, 8.10. Peppa Pig: Festival Of Fun (U) Fri-Thu 10.15, 12.15, 2.15, 4.15. Pet Sematary (15) Fri & Sat 12.00, 1.30, 4.00, 6.30, 7.50, 9.00; Sun, Mon, Tue & Wed 11.00, 1.30, 4.00, 6.30, 7.50, 9.00; Thu 11.00, 1.30, 4.00, 6.30, 9.10. IMAX 3D: Shazam! (12A) Fri-Thu 11.30, 2.30, 5.30, 8.30. Shazam! (12A) Fri-Thu 10.15, 1.15, 6.15, 7.15. Movies For Juniors: The Kid Who Would Be King (PG) Fri, Sat & Sun 10.20. Mon, Tue, Wed & Thu 10.10. The Lego Movie 2: The Second Part (U) Fri & Sat 10.50; Sun 10.40; Mon, Tue & Wed 11.40; Thu 9.50. The Sisters Brothers (15) Fri, Sat, Sun, Tue, Wed & Thu 5.10, 8.00; Mon 5.10, 8.40. Us (15) Fri & Sat 5.00, 8.50; Sun & Thu 8.50; Mon 6.00; Tue & Wed 6.10. Autism Friendly Screening: Dumbo (PG) Sun 11.00. Bolshoi Ballet 2019: The Golden Age (12A) Sun 4.00. Unlimited Screening: Eighth Grade (15) Mon 8.00. Wonder Park (PG) Mon, Tue, Wed & Thu 11.15, 1.00, 3.15, 5.30. Hellboy (15) Thu 6.00, 9.00. NT Live: All About Eve (12A) Thu 7.00. New Park (01243 786650): Old Boys (15) Fri 1.15; Sat 12.45; Mon 8.30; Thu 5.00. Fisherman’s Friends (12A) Fri 3.30; Sat 5.45; Sun 11.45, 8.45; Mon 12.45, 6.00; Tue 1.15, 8.30; Wed 2.15; Thu 11.45. Free Solo (12A) Fri 6.00; Sat 3.15; Sun 6.30. Cold Pursuit (15) Fri 8.15; Sat 8.15; Wed 4.45. La Forza Del Destino (PG) Sun 2.00. The Kid Who Would Be King (PG) Mon 3.15; Tue 6.00; Wed 11.45; Thu 2.15. Rembrandt (PG) Tue 3.45. NT Live: All About Eve (15) Thu 7.00. Arts Centre (01483 278000): Royal Opera House Live Encore: La Forza Del Destino (12A) Fri 6.15. NT Live: All About Eve (12A) Thu 7.00. Cineworld (0871 200 2000): Captain Marvel (12A) Fri & Sat 1.10, 4.10, 5.15, 7.10, 8.10, 11.00; Sun 1.10, 5.15, 7.10, 8.15; Mon 1.30, 4.20, 7.10, 8.45; Tue 1.20, 4.10, 7.10, 8.15; Wed 1.30, 4.20, 7.10, 8.15; Thu 1.10, 4.00, 7.10, 8.40. Dumbo (PG) Fri & Sat 10.20, 11.10, 11.50, 12.30, 1.10, 1.50, 2.30, 3.15, 3.50, 4.30, 5.10, 6.30, 7.50, 10.30; Sun 10.20, 11.50, 12.30, 1.10, 1.50, 2.30, 3.10, 3.50, 4.30, 5.10, 6.30, 7.50; Mon 10.20, 11.10, 11.50, 12.30, 1.10, 1.50, 2.30, 3.10, 3.50, 4.30, 5.10, 6.30, 8.15; Tue, Wed & Thu 10.20, 11.10, 11.50, 12.30, 1.10, 1.50, 2.30, 3.10, 3.50, 4.30, 5.10, 6.30, 7.50. Fighting With My Family (12A) Fri 10.20pm; Sat & Wed 9.10pm. Fisherman’s Friends (12A) Fri & Sat 5.40, 8.15; Sun 5.40, 8.40; Mon & Wed 5.30, 8.10; Tue 5.30, 8.40; Thu 8.15. How To Train Your Dragon: The Hidden World (PG) Fri, Sat, Sun & Thu 10.30; Mon, Tue & Wed 10.20. Missing Link (PG) Fri-Thu 10.00, 11.10, 12.20, 1.30, 2.40, 3.50, 5.00, 6.10, 8.30. Peppa Pig: Festival Of Fun (U) Fri, Sat, Sun, Mon, Tue & Wed 10.15, 11.15, 12.15, 1.15, 2.15, 3.15, 4.15; Thu 10.15, 12.15, 2.15, 4.15. Pet Sematary (15) Fri & Sat 12.50, 3.20, 6.20, 7.30, 8.50, 10.00, 11.00; Sun, Mon, Tue, Wed & Thu 12.50, 3.20, 6.20, 7.30, 8.50. 4DX 3D: Shazam! (12A) Fri-Thu 12.00, 3.00, 6.00, 9.00. IMAX 3D: Shazam! (12A) Fri & Sat 10.40, 1.40, 4.40, 7.40, 10.40; Sun, Mon, Tue, Wed & Thu 10.40, 1.40, 4.40, 7.40. Shazam! (12A) Fri & Sat 10.00, 11.20, 1.00, 2.20, 4.00, 5.20, 7.00, 8.20, 10.00; Sun 1.00, 2.20, 4.00, 5.20, 7.00, 8.20; Sun 10.00, 11.20, 1.00, 2.20, 4.00, 5.20, 7.00, 8.20; Mon, Tue, Wed & Thu 10.00, 1.00, 4.00, 5.20, 7.00, 8.20. Autism Friendly Screening: Dumbo (PG) Sun 11.00. Bolshoi Ballet 2019: The Golden Age (12A) Sun 4.00. Movies For Juniors: The Kid Who Would Be King (PG) Fri-Thu 10.00. The Lego Movie 2: The Second Part (U) Fri, Sat, Sun & Thu 10.20; Mon & Wed 11.00; Tue 10.40. The Sisters Brothers (15) Fri, Sat & Tue 5.50, 8.45; Sun & Mon 5.50, 9.10; Wed 5.50, 8.40; Thu 5.45, 9.10. Us (15) Fri & Sat 12.10, 3.00, 6.00, 7.20, 8.40, 10.10; Sun 12.10, 3.00, 6.00, 7.45, 8.40; Mon & Wed 12.00, 2.50, 6.00, 7.20, 8.40; Tue 12.00, 2.50, 6.00, 8.10, 9.10; Thu 11.40, 2.30, 6.00, 8.40. What Men Want (15) Fri 9.10; Sat 10.20. Malayalam: Lucifer (12A) Sun 8.10. Unlimited Screening: Eighth Grade (15) Mon 8.00. Wonder Park (PG) Mon, Tue, Wed & Thu 11.30, 1.40, 3.50, 6.00. A Clockwork Orange (18) Tue 7.00. Hellboy (15) Thu 12.00, 2.50, 5.40, 8.30. NT Live: All About Eve (12A) Thu 7.00. The Hawth (01293 553636): Royal Opera House Live Encore: La Forza Del Destino (12A) Fri 7.15. Cineworld (0871 200 2000): Captain Marvel (12A) Fri & Sat 11.40, 2.50, 4.15, 7.15; Sun 10.20, 1.00, 4.15, 8.20; Mon, Tue & Wed 2.50, 4.15, 7.15; Thu 2.50, 4.10, 8.20. Dumbo (PG) Fri, Tue, Wed & Thu 10.30, 12.00, 1.10, 2.40, 5.20, 8.00; Sat 10.30, 12.00, 1.10, 2.40, 5.35, 8.00; Sun 12.00, 1.10, 2.40, 5.20, 8.00; Mon 10.30, 12.00, 1.10, 2.40, 5.20, 8.20. Fisherman’s Friends (12A) Fri, Sat, Tue & Wed 8.20; Sun 7.15; Mon 5.50. Missing Link (PG) Fri, Sat, Mon & Tue 11.00, 1.30, 3.40, 6.00; Sun 10.50, 1.20, 3.40, 6.00; Wed & Thu 11.00, 1.20, 3.40, 6.00. Peppa Pig: Festival Of Fun (U) Fri-Thu 10.15, 12.15, 2.15. Pet Sematary (15) Fri-Thu 3.50, 6.20, 8.50. Shazam! (12A) Fri-Thu 11.30, 2.30, 5.30, 8.30. Us (15) Fri, Sat, Tue & Wed 5.50, 8.40; Sun & Mon 8.40; Thu 5.50. Autism Friendly Screening: Dumbo (PG) Sun 11.00. Bolshoi Ballet 2019: The Golden Age (12A) Sun 4.00. Unlimited Screening: Eighth Grade (15) Mon 8.00. Wonder Park (PG) Mon, Tue, Wed & Thu 10.40, 12.50. Hellboy (15) Thu 8.40. NT Live: All About Eve (12A) Thu 7.00. Curzon (01323 731441): Pet Sematary (15) 2.10 (not Fri, Sat & Sun); 5.10, 8.10. Dumbo (PG) 2.00, 5.00, 8.00. Wonder Park (PG) Mon-Thu 2.10. Fisherman’s Friends (12A) 2.05, 5.05. Captain Marvel (12A) 8.05. Scott Cinemas – The Atrium Cinema (01342 321666): Fisherman’s Friends (12A) Fri, Sat & Mon-Thu 6.15; Sun 5.40. Us (15) Fri, Sat & Mon-Wed 8.45; Sun 8.10. Missing Link (PG) Fri, Sat & Mon-Thu 1.35, 3.55; Sun 1.00, 3.20. Shazam! (12A) Fri, Sat & Mon-Thu 2.00, 5.05, 8.00; Sun 12.35, 5.00, 8.00. Peppa Pig: Festival Of Fun (U) Fri 3.15; Sat, Sun, Mon & Tue 12.30; Wed & Thu 11.50. Kids Crew: Smallfoot (U) Sat 10.20. Kids Crew: Ralph Breaks The Internet: Wreck-It Ralph 2 (PG) Sat 10.20. Bolshoi Ballet: The Golden Age (Pre-Recorded) (12A) Sun 4.00. Silver Screen: Puzzle (15) Wed 10.30. National Theatre Live: All About Eve (12A) Thu 7.00. Hellboy (15) Thu 8.45. Pavilion (01323 841414): Fisherman’s Friends (12A) Fri-Tue 7.45; Wed 2.15, 7.45; Thu 2.15. The Lego Movie 2: The Second Part (U) Sat-Tue 2.15; Wed & Thu 11.00. NT Live: All About Eve (12A) Thu 7.00. The Capitol (01403 750220): Dumbo (PG) Fri, Tue & Wed 1.45, 4.45, 7.45; Sat 10.30, 1.45, 4.45, 7.45; Sun 2.00, 4.45, 7.45; Mon & Thu 11.00, 1.45, 4.45. Peppa Pig: Festival Of Fun (U) Fri & Wed 12.15, 2.15, 4.15; Sat 11.00, 1.15, 3.15; Sun 2.30, 4.15; Mon 10.30, 11.30, 12.30, 1.30, 2.30; Tue 11.30, 12.15, 1.30, 2.15, 4.15; Thu 10.30, 12.30, 2.30. The Keeper (15) Fri & Sun 7.15; Sat 5.15, 8.15; Mon 3.30, 5.15, 7.30, 8.15; Tue 3.30, 7.15, 7.30; Wed 7.15; Thu 5.15, 8.15. Horsham Film Society: The Handmaiden (18) Mon 8.00. Exhibition On Screen: Rembrandt (12A) Tue 7.30. NT Live: All About Eve (12A) Thu 7.00. Everyman (0872 436 9060): Dumbo (PG) Fri 11.00, 2.45, 4.00, 5.45, 7.15; Sat 11.45, 2.30, 7.00; Sun 10.00, 2.00, 4.15, 8.00; Mon 1.00, 5.00, 7.00; Tue 11.15, 1.45, 5.30, 8.30; Wed 1.15, 3.45, 7.00; Thu 9.45, 2.30, 5.30, 8.30. The White Crow (12A) Fri 8.45; Sat 3.15; Sun 6.45; Tue 7.00; Wed 8.30; Silver Screen: Tue 12.00; Baby Club: Wed 11.15. Shazam! (12A) Fri 11.30, 12.15, 4.45, 8.00; Sat 11.00, 4.00, 8.30; Sun 11.30, 3.15, 7.15; Mon 10.30, 12.00, 3.30, 8.15; Tue 10.30, 3.30, 7.45; Wed 12.15, 4.30, 7.45; Thu 11.15, 1.30, 4.45, 8.00. Missing Link (PG) Fri 2.00; Sat 10.15, 1.00, 5.40; Sun 10.45, 1.15, 5.15; Mon 10.00, 1.45, 4.15; Tue 2.30, 4.45; Wed 10.30, 2.30, 5.30; Thu 10.30, 12.45, 3.45. A Clockwork Orange (Re: 2019) (18) Sat 7.45. Joni 75: A Birthday Celebration (PG) Mon 7.30. NT Live: All About Eve (2019) (12A) Thu 6.50. Depot (01273 525354) (lewesdepot.org): Dumbo – 3D (PG) Mon 7.45; Thu 5.00. Dumbo (PG) Fri 2.00, 5.00, 8.00; Sat, Sun & Wed 11.00, 2.00, 5.00, 8.00; Mon 11.00, 2.00, 5.00; Tue 11.00, 1.45, 4.45, 7.30; Thu 11.00, 2.00, 8.00; Autism Friendly: Sun 11.15. The Sisters Brothers (15) Fri 5.15, 8.15; Sat & Sun 5.30, 8.15; Mon 2.30, 5.15; Tue 5.45, 8.30; Wed 12.00, 5.30, 8.15; Thu 3.45, 8.15. Happy As Lazzaro (12A) Fri 5.30, 8.30; Sat 6.15; Sun 2.15, 7.45; Mon 8.15; Tue 8.00; Wed 11.30, 5.15; Thu 5.30. The White Crow (15) Fri, Sat, Tue & Wed 2.30; Sun 2.45, Mon 5.30; Thu 12.45. At Eternity’s Gate (12A) Fri, Mon, Wed & Thu 2.45; Sat 3.45; Sun & Tue 5.15. Carrie (18) Sat 9.00. Groundswell (PG) Mon 8.00. Dementia Friendly Screening: The Wizard Of Oz (U) Tue 2.00. A Deal With The Universe (15) Wed 8.00. NT Live: All About Eve (12A) Thu 7.00. Seaford Community Cinema, Barn Theatre (www.seafordcinema.org): King Of Thieves (15) Fri 7.30. NT Live: All About Eve (12A) Thu 7.00. The Picture House (01825 764909): Shazam! (12A) Fri-Wed 12.15, 3.0, 5.45, 8.25; Thu 1.00, 5.45, 8.25. Missing Link (PG) Fri, Mon, Tue & Wed 11.00, 1.45, 3.55; Sat 10.10, 1.45, 3.55; Sun 11.00, 1.05; Thu 10.40, 1.20, 3.30. Dumbo (PG) Fri, Mon, Tue & Wed 11.15, 1.15, 3.45, 6.10; Sat & Sun 10.45, 1.15, 3.45, 6.10; Thu 10.50, 1.30, 3.55. The Keeper (15) Fri, Sat, Mon & Wed 6.00, 8.35; Sun 7.45; Tue 8.35; Thu 3.45. Fisherman’s Friends (12A) Sun, Mon, Tue & Wed 8.30; Thu 11.00. Captain Marvel (12A) Fri & Sat 8.30. Saturday Morning Movie: The Grinch (U) Sat 10.30. Bolshoi Ballet: The Golden Age (12A) Sun 4.00. Exhibition On Screen: Rembrandt (12A) Tue 6.30. NT Live: All About Eve (12A) Thu 7.00. Dome (01903 823112): Dumbo (PG) Fri 10.00, 11.50, 2.30, 5.45, 8.15; Sat & Sun 10.45, 11.50, 2.30, 5.45, 8.15; Mon 10.20, 11.50, 2.30, 5.45, 8.15; Tue & Wed 11.50, 2.30, 5.45, 8.15; Thu 11.50, 2.30, 5.45. Hellboy (15) Thu 8.20. How To Train Your Dragon: The Hidden World (PG) Sat & Sun 10.00. Missing Link (PG) Fri, Sat & Sun 9.45, 12.30, 1.45, 3.55, 6.05; Mon 9.45, 12.15, 1.00, 3.20, 5.40; Tue & Wed 9.45, 12.20, 1.45, 3.55, 6.05; Thu 9.45, 12.20, 1.45, 4.00, 6.15. Pet Sematary (15) 8.30. Shazam! (12A) Fri, Tue & Wed 10.45, 2.45, 5.10, 8.10; Sat & Sun 2.45, 5.10, 8.10; Mon 2.45, 5.10, 8.10; Thu 10.45, 2.45, 5.10, 8.15. Wonder Park (PG) Mon, Tue, Wed Thu 10.00. Connaught (01903 206206): Dumbo (PG) Fri 10.15, 12.45, 3.15, 5.45; Sat 12.45, 3.15, 5.45; Sun & Wed 12.45, 3.15, 5.45, 8.15; Mon 10.15, 12.45, 3.15, 5.45, 8.15; Tue 12.45, 3.15, 5.45, 8.15; Thu 10.15, 12.45, 3.30, 5.45. Fisherman’s Friends (12A) Fri & Sat 8.15; Sun & Tue 3.00, 8.30; Mon & Wed 12.30, 6.00; Thu 3.15, 8.15. Saturday Morning Pictures: The Greatest Showman (PG) Sat 10.15. The Greatest Showman (PG) Sun 10.00. Autism Friendly Screening: Dumbo (PG) Sun 10.15. How To Train Your Dragon: The Hidden World (PG) Sun 12.30; Mon, Tue, Wed & Thu 10.00. The White Crow (12A) Sun 5.30; Mon & Wed 3.00, 8.30; Tue 12.30, 5.50; Thu 12.30. NT Live: All About Eve (12A) Thu 7.00. Ten things to see in East Sussex, Friday to Thursday, April 5-11. Click here to read more.